Heartwood and sapwood are parts of every tree. These two play very special roles in the formation of a tree, not to mention their respective roles to each other. Let’s go ahead and find out how they are distinguished from each other. “Dead” region of a tree Living region of a tree. Makes a tree structurally stronger Stores and transports water and minerals throughout the tree. Heartwood is wood that has grown resistant to decay caused by both natural and chemical transformation. It is also called “duramen,” and its formation occurs naturally as it is genetically programmed among trees. Although heartwood is often considered the dead part of the wood, it is not fully certain if the wood dies during its formation. 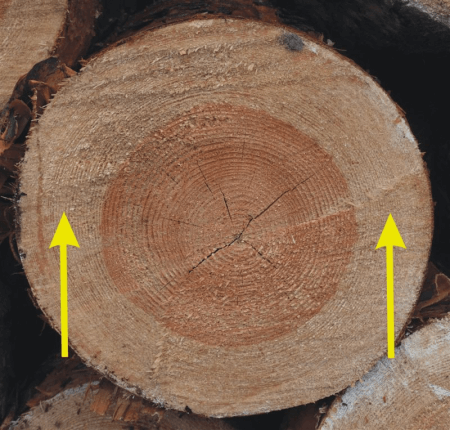 When a tree ages, part of the entire cross-section of its trunk stops conducting sap. This middle section is the heartwood. Combined with its growing need for an increased structural support, significant changes start to happen in the wood. These cells around the center decay but remain intact to serve another purpose. The residue from these decaying cells in addition to other chemical compounds in the plant accumulate and solidify the hardwood, providing strength to the tree. Heartwood is sometimes the darker portion of the growth rings. However, insect infestation and decay can also cause discoloration in wood, including woody plants that do not have heartwood. Sapwood is the outermost layer of the wood. It is also called “alburnum” and is the living wood in a growing tree. Its main role is to bring water from the roots to the leaves. Sapwood also helps bring stored water in the leaves back to the roots when water is scarce. Beneath the bark is a thin layer of living cells called “cambium.” This layer of cambium plays a crucial part in the production of sapwood. It also produces the bark cells which forms outside. A new layer of wood cells develop inside the cambium each year, increasing a tree trunk’s girth and strength. The cambium moves outward as new layers of wood develop inside. Sapwood is produced and forms the new outer layer of wood. Its composition of active and living cells help process water and minerals throughout the tree. 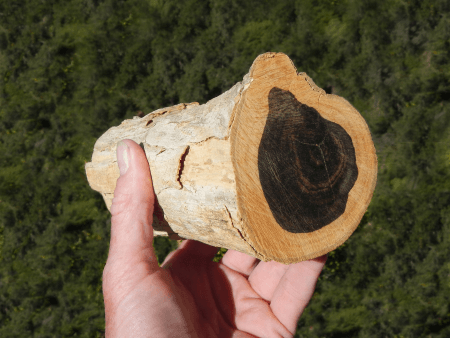 So, what’s the difference between heartwood and sapwood? Heartwood is commonly regarded as the dead part of a tree while sapwood is the living, growing part. Despite the common notion about heartwood, there’s much debate about it being actually dead. In most cases, heartwood is the dark portion of a cross-sectioned wood, while the light-colored portion is sapwood. Heartwood is made up of dead cells and other chemical compounds in the tree. In contrast, sapwood is composed of active living cells critical to storing and transporting water and minerals between the roots and the crown of the tree. Heartwood makes the tree structurally stronger. It is usually near the center of the wood.